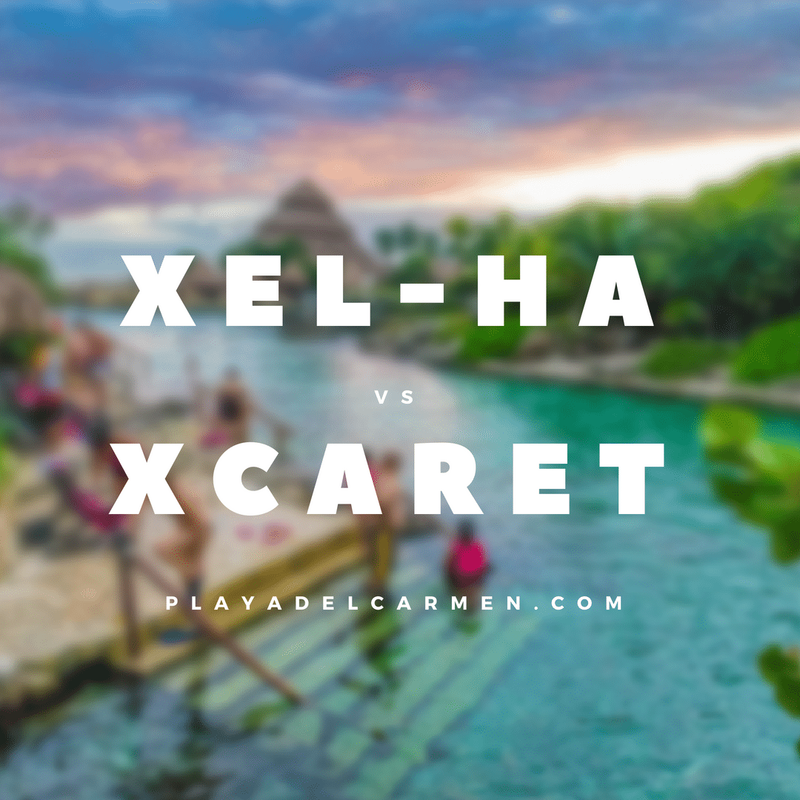 What’s the difference between Xel-Ha or Xcaret I hear you ask? 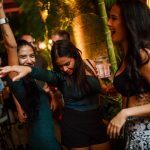 It’s a question we get a lot here at PlayaDelCarmen.Com. 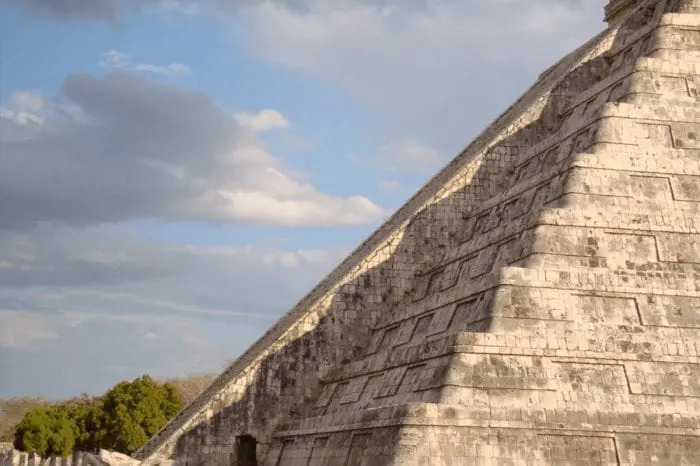 If you’ve been debating which tourist attraction is best for you or your group during your next trip to Mexico, fear not, we’re here to help! Safe to say both attractions have earned rave reviews over the years. Yes, choosing between them can be a little difficult… especially if you’ve never been before. In this article, we’ll clue you in on the differences between them and answer any questions you may have. First, how do you even pronounce them? 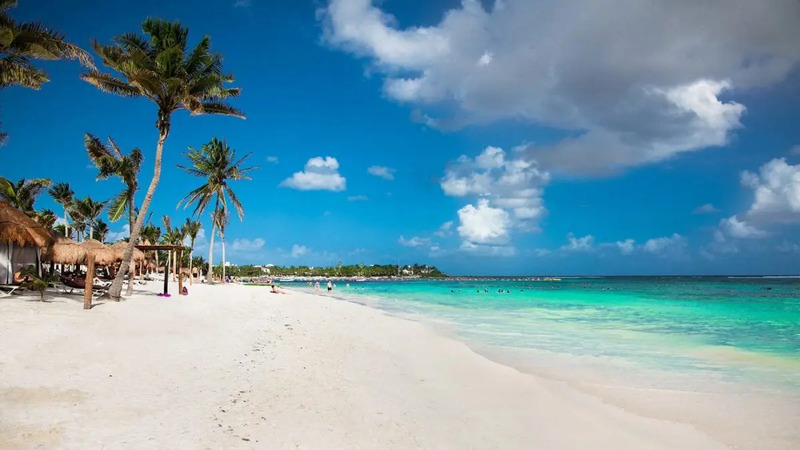 By choosing to stay in Playa del Carmen or surrounding areas in the Riviera Maya, you’ve positioned yourself in a prime location. You will be within close proximity to all of the regions top attractions. This area of the world is famed for its beautiful waters and vibrant marine life! Both Xel-Ha and Xcaret are celebrated for their lush surroundings and water-based activities. But how do you know which one will you enjoy most? 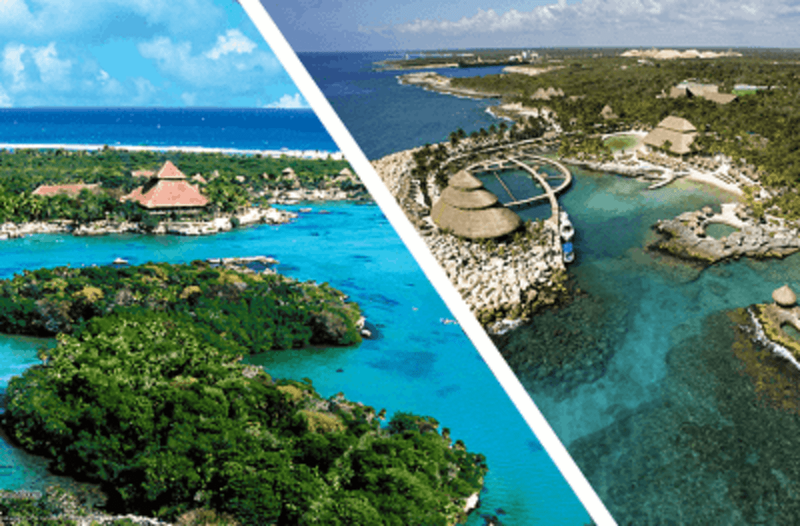 What are Xel-Ha and Xcaret? Different activities at each park? Are they suitable for kids? Top tips for each park. 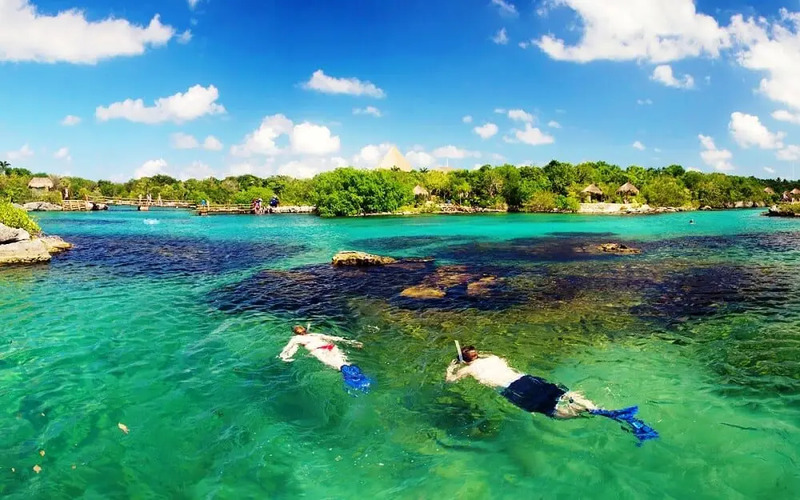 Xel-Ha is every snorkeler and swimmers dream! 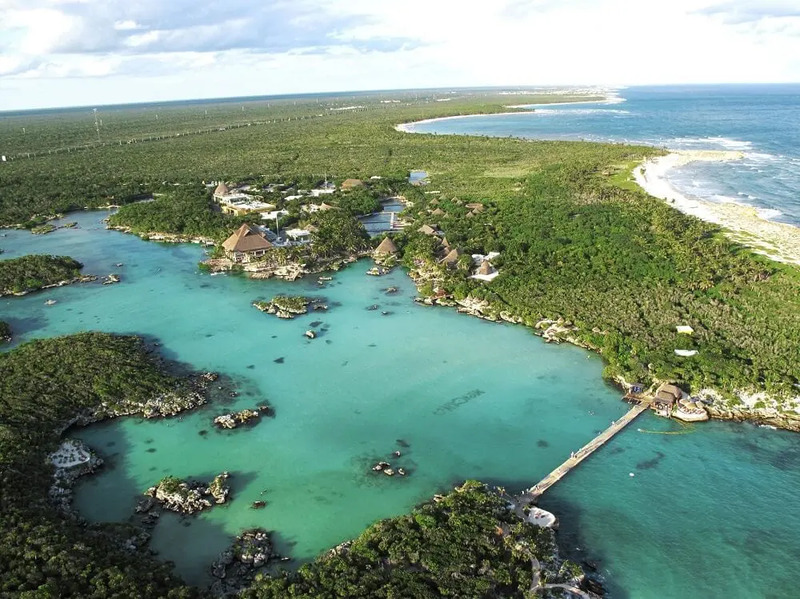 It’s regarded as one of the world’s greatest Natural Wonders and provides the opportunity to marvel at the wide variety of marine species that inhabit the cove and its cenotes. 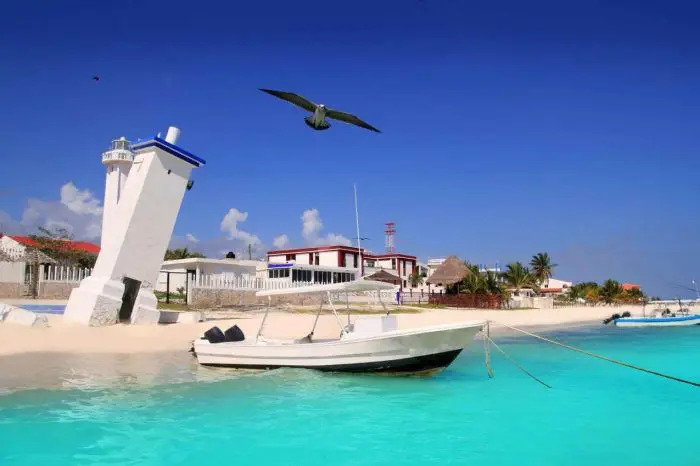 Here you can enjoy water activities, ecological attractions, restaurants, and beautiful scenery. It’s an all-inclusive aquatic theme park that is fun for guests of all ages. 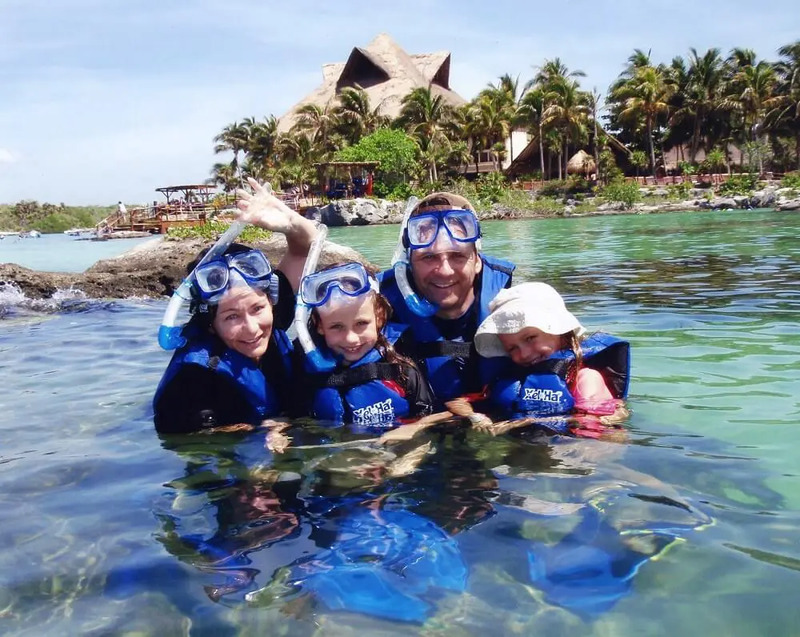 Xcaret Park is easily one of the top Playa del Carmen attractions for the entire family! Particularly if you have younger children who just aren’t that keen on swimming yet. Because this attraction is much more focused on entertainment, animals, and nature. 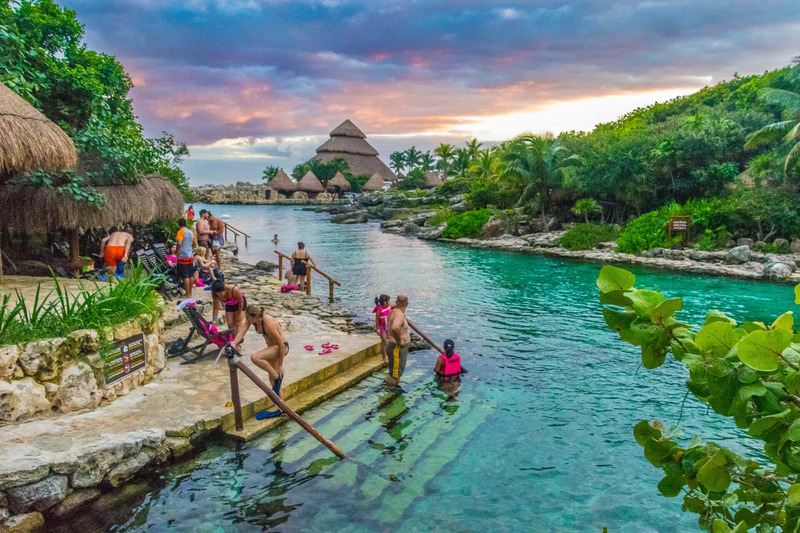 Xcaret is a natural sanctuary showcasing the colorful history of Mexico and combining it with fun traditions and Mayan culture. The attractions are in perfect harmony with its lush surrounding characterized by beautiful underground waterways, lush fauna, and much more! In this zoo-like jungle environment, you can swim, snorkel, visit a Mayan village where you can see a Shaman perform a ceremony, or visit a coral reef aquarium where you can even hold a sea cucumber! You will see unforgettable shows, and fall in love with Mexican culture and its people. Don’t worry if it’s not super close to your accommodation roundtrip transportation is provided. 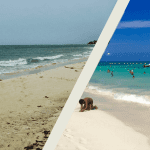 For the past few weeks, the Riviera Maya has suffered numerous outbreaks of seaweed on the beaches. Obviously, this is not what any traveler wants to hear. Xel-Ha forms part of an inlet which avoids the seaweed that sometimes gets dragged onto our shorelines by different currents. Xcaret is located in Playa del Carmen, just south of Playacar and is the size of 40 football fields. 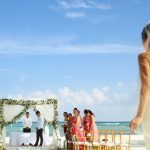 It is located approximately 75 kilometers south of Cancun and6.5 kilometers south of Playa del Carmen along highway 307. 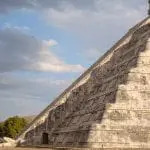 It was named after the close by archeological site Xcaret, a settlement constructed by the pre-Columbian Maya. Some of these structures still lie within the boundaries of the park, so keep your eyes peeled! 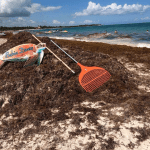 Again, if you are looking to avoid any pesky seaweed that has found itself on the shores of the Riviera Maya visiting Xcaret is the perfect activity as it forms part of another inlet that tends to avoid the masses of sargassum that have been showing up here over the last few weeks. What’s included with your entry ticket at Xel-Ha? 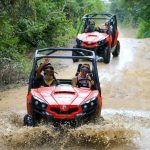 Unlike Xcaret, these fun activities are included in the entry price and don’t carry any additional charge. 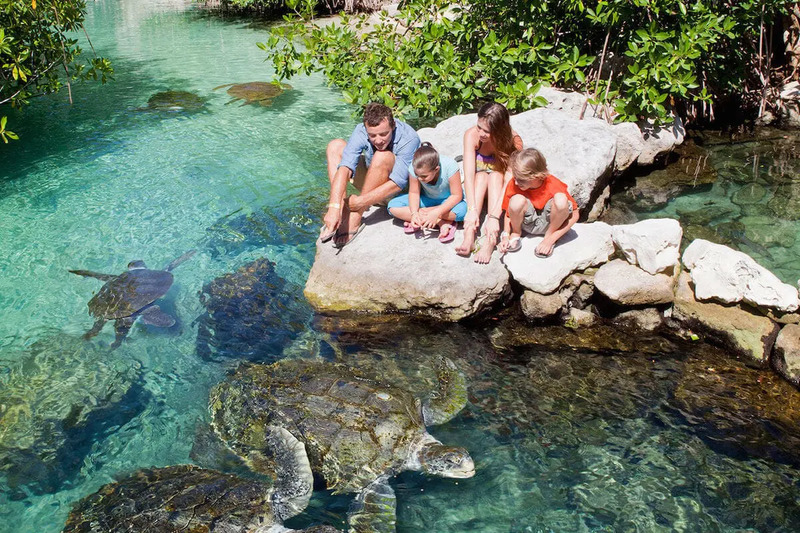 Once you arrive at Xel-Ha prepare to marvel at an array of tropical fish, grab an inner tube and float down the lazy river through picturesque mangroves, feel the fresh water of a cenote meet the warmer sea, and more! Thrill seekers can even participate in some zip lining, or jump from the cliff of courage. 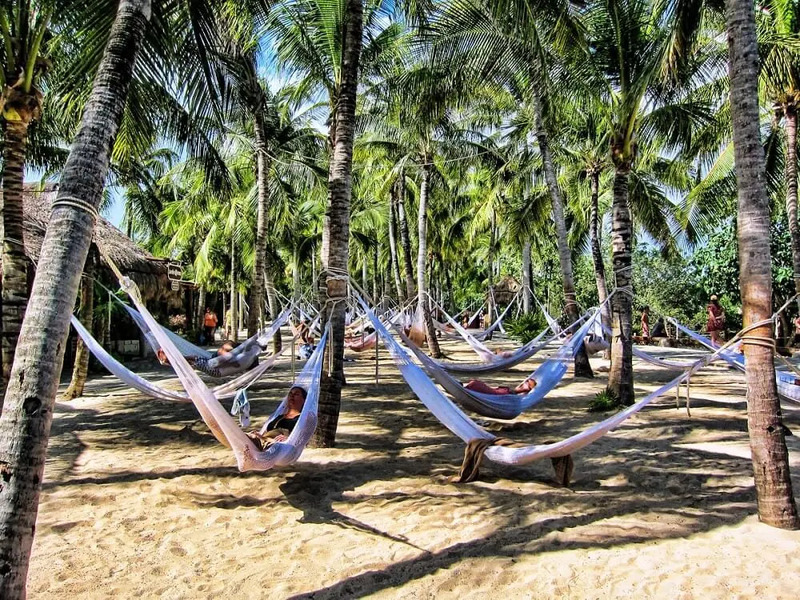 If you are hoping for a more relaxed visit hang out in the hammock gardens which are certain to leave you feeling Zen-like after a refreshing nap. It’s time to immerse yourself in the cenotes, lagoons, and caves that make this region of Mexico so unique. 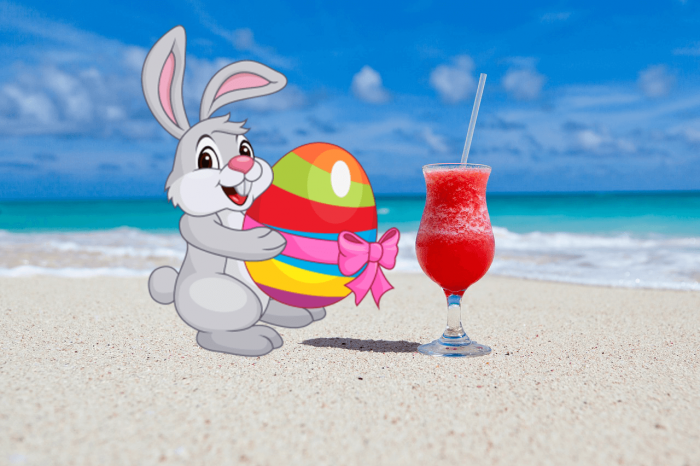 You even have the opportunity to add these services to your Xel-Ha package for a more complete experience (please note they come at an extra charge). Xcaret has way more animals to see, there is an aquarium, butterfly pavilion, jaguars, sea turtles, tapirs, monkeys, birds, and much more. There are 3 underground rivers you can swim and snorkel in. Xcaret has mini shows throughout the day that focus on Mexican traditions and the country’s people. There is a grand show at the end of the day. This lasts around 2/12 hours long. With over 300 participants, it roughly tells the story of how the Mayan people and how the Spanish came to arrive at Mexico’s shores. 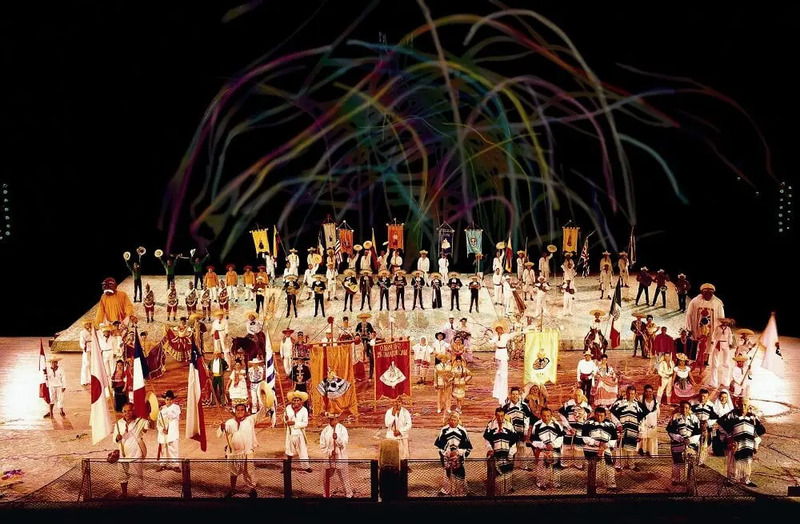 For many visitors, the grand show is the highlight of their trip to Xcaret. Please note snorkels do cost extra from the basic entry price, but you can still swim here with just a life jacket if you choose. At Xcaret, there is no need to follow a tour guide. You choose what interests you most, follow your own schedule and set your own pace. Want to know more about which each activity entails? 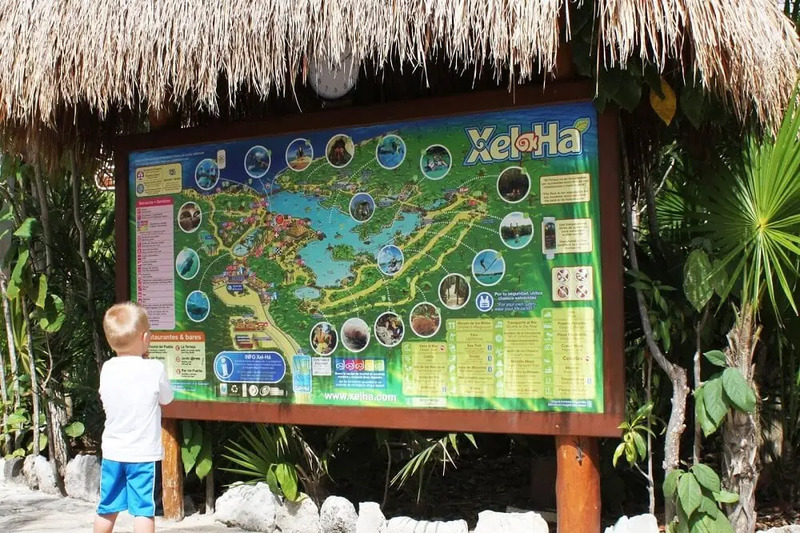 Is Xel-Ha Suitable for Kids? Kids 0-4 are FREE with ID. Child pricing applies to children between the ages of 5 -11. If your child measures more than 55′ but is under 12 years, please bring ID to qualify for the child price. To get the most from your family experience it definitely helps if your child is confident in the water and can already swim. Although lifejackets are, of course, provided. 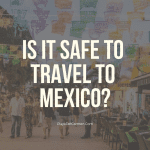 Is Xcaret Suitable for Kids? 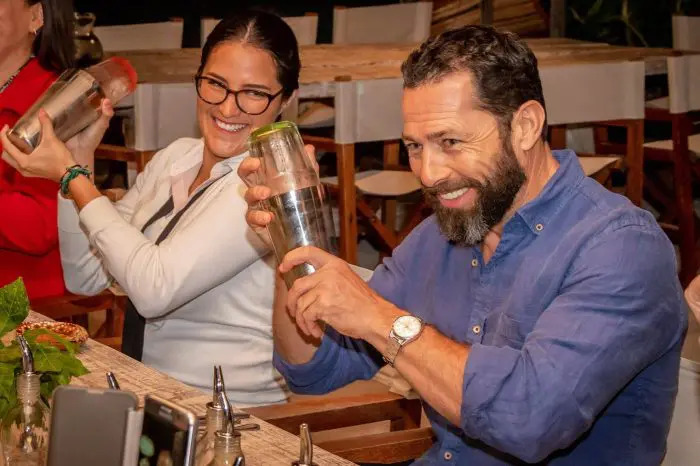 Unlike Xel-Ha, Xcaret doesn’t rely heavily on water activities, swimming, and snorkeling, there’s a more diverse choice of things to see and do. This is great if you have younger children who aren’t really so confident in being in the water all day and prefer to do other things. Children ages 0-4 are free, with ID. Child price applies between the ages of 5-11. They do have strollers available for rent on site if you don’t want to bring your own as there is a lot of walking involved. At this park, all your food and drink is included for the day! It’s completely all-inclusive. You can eat breakfast and lunch here, make the most of the snacks and open-bar. At this attraction, you will need to purchase most of the food you consume. Choose from the buffet or snack bar. The buffet is $27/$29 USD pp. It’s useful to factor in this expense to your day before you visit to avoid any unexpected surprises. If you stay for the grand show (which you should) please note you won’t be arriving back at your hotel or rental until late for dinner. 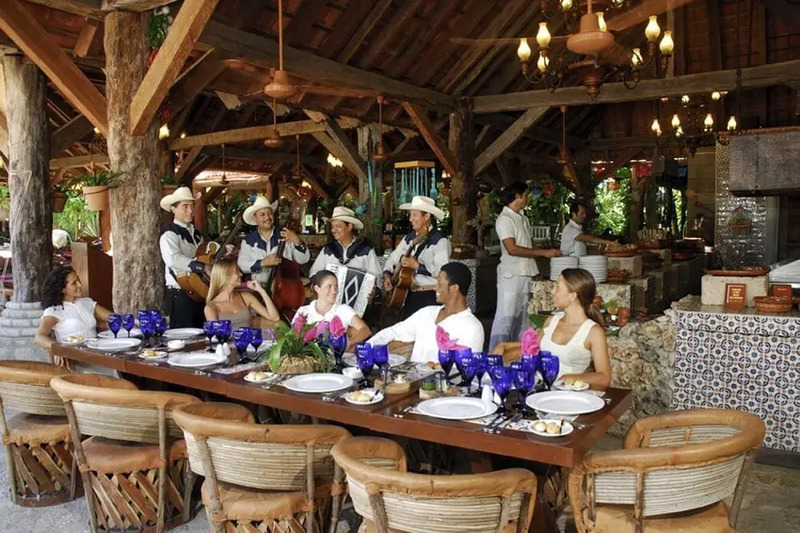 Xcaret offers a different package that includes lunch buffet among other useful perks. By choosing this option you will save more money than you would if you were to just choose to buy it on the day. They also offer an option to dine at the grand show at the end of your day. 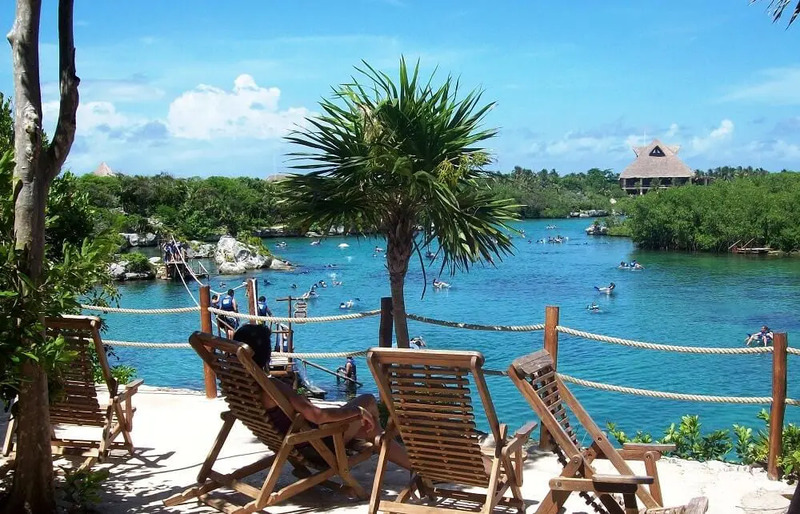 It may be a little more expensive than Xel-ha but Xcaret opens for 13 hours a day and boasts a wide range of diverse activities. Xel-Ha is extremely dedicated to encouraging sustainable tourism. It is for this reason that they kindly ask you to wear biodegradable sunscreen and bug repellent. As you can imagine millions of people visit this attraction each year. Lathering your body with chemicals isn’t good for your health or this incredible habitat. Traditional sunscreen can be extremely damaging to the limestone formations and animals local to the attraction. We all want our kid’s kids to be able to enjoy natural treasures like this in the future. Biodegradable sunscreen and bug repellent is the way to go. A $25 USD refundable security deposit will be needed for your locker and equipment provided. 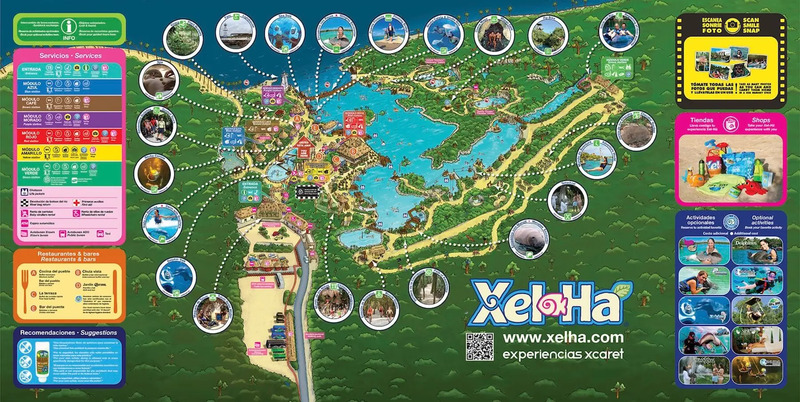 On the way in, check the Xel-Ha map and plan out your day accordingly to maximize your time. There is a lot to see so make sure you don’t miss a beat. 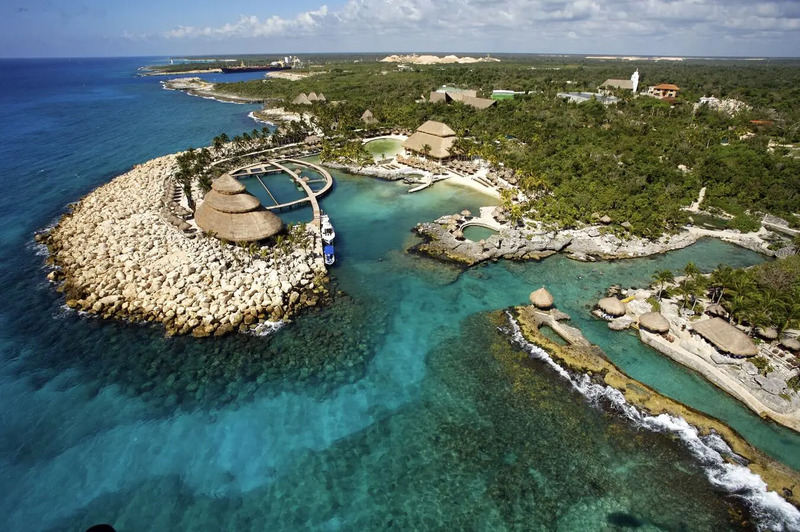 Xcaret is a natural sanctuary that has to be protected and sustained. It is for this reason that they kindly ask you to wear biodegradable sunscreen and bug repellent. Millions of people visit this attraction each year and with it, they bring tons of damaging chemicals on their skin. These chemicals are not only damaging to the million-year-old rock formations here at Xcaret but to the animals as well. If you want your kid’s kids to be able to enjoy natural treasures like this in the future then PLEASE wear biodegradable sunscreen and bug repellent. A 25$ USD refundable deposit if getting lockers and/or equipment. 3. Comfortable Shoes & Eat Breakfast! 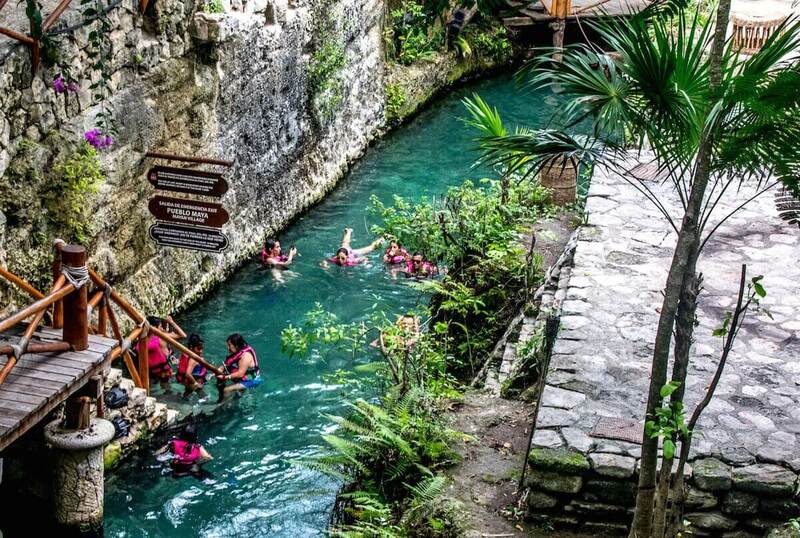 You’ll be doing A LOT of walking because there’s so much to see at Xcaret. It’s a wonderful day with plenty of adventures for the whole family. You can also buy a 2-day pass if you don’t want to try and cram everything into one day, more time for more fun! They do offer facilities for disable people and have wheelchairs available for rent if you don’t want to bring your own. You will also find a hydraulic chair to help you access the river. Please note that you will be asked to leave a refundable deposit of $25US to use the hydraulic chair. However, guests with limited mobility may find it difficult/impossible to access the underground rivers. The park proudly claims that 50% of the services at this park are available to guests using wheelchairs. You will also find wheelchairs for rent if you do not wish to bring your own. This attraction offers 3 different price packages. Includes round-trip transportation, access to the park with all food and drinks. It also includes the snorkel and lazy river equipment, lockers, towels, and access to showers. Kids are FREE (ages 0-4) with ID. Want just the entrance ticket? We can help you with that too. 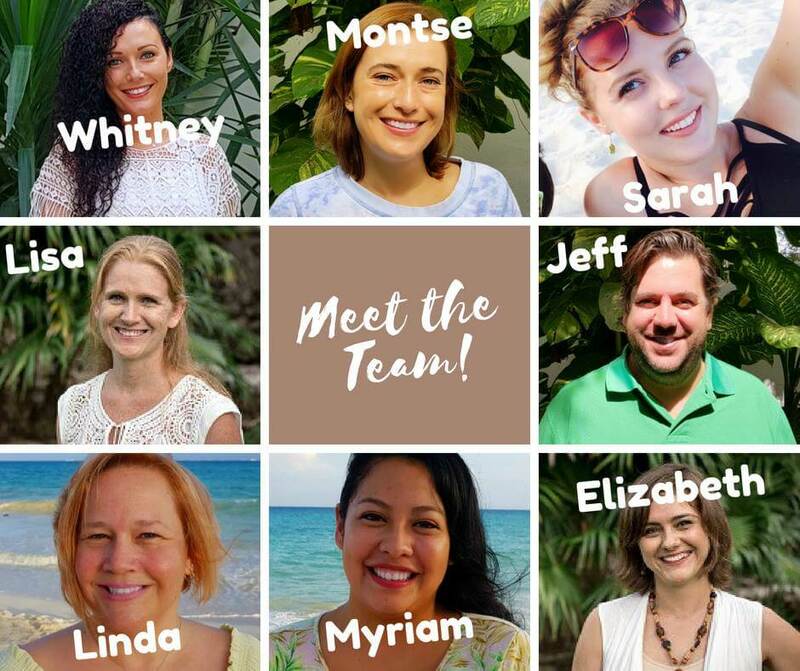 Want to experience Xel Ha but not the full day? THE BASIC PACKAGE: includes the entrance + evening show (food + drink is extra). THE PLUS PACKAGE: includes the entrance, lockers, towels, equipment for the underground rivers and one access to the buffet restaurant during the day + the evening show (recommended). 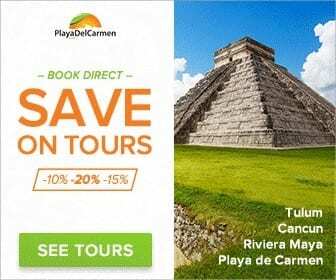 Save Money on Xel-Ha and Xcaret! 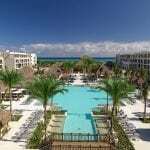 Here at PlayaDelCarmen.Com, we’ll make sure you get the best deal on either Xel-Ha or Xcaret, heck, maybe even both! Contact one of our expert local travel planners today. Or call us on our toll-free number at 1-888-537-9797. We’d be happy to assist you in getting the best deal. We help 1000s of travelers like you save money every year. Don’t forget to SHARE this with friends and family on social media. We hope you found this review to be helpful, if you have any questions be sure to comment below, we would be happy to answer them. ?